Please refer to our stock # kjl2 when inquiring. This wonderful vintage necklace was designed by renowned costume jeweler, Kenneth Jay Lane. It is 18" long and has 3 gold medallions across the front, with the largest measuring 2 1/4" long x 1 3/4" wide. 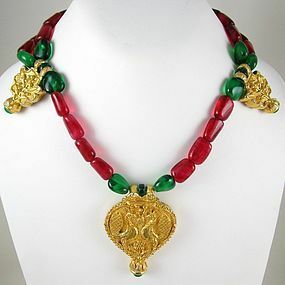 It has red and green glass beads resembling included emeralds and rubies and the metal panels have a gold tone finish. There is some light wear from age, but overall it is in very good condition. The reverse side is signed "KJL".